Thomas Ward is the seventh son of a seventh son and can see evils that others cannot. When it comes time for his apprenticeship his father has run out of favors and Thomas must become an apprentice to Old Gregory, the county Spook, ridding the county of evil. 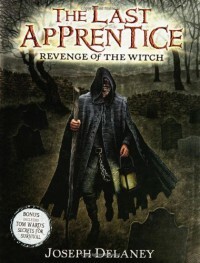 This was a great introduction into the world of The Last Apprentice. It is a world filled with boggarts, witches, and other creepers. You learn along side Thomas about the types of boggarts and witches and how to bind them so that they cannot break free. The book was dark and creepy but in an enjoyable way. Thomas makes many mistakes throughout his first year as an apprentice but he is only 13 years old and learns from situations. The novel follows the story of Thomas Ward owing a favor to a girl with pointy shoes which results in a highly dangerous creature getting away. The fallout that ensues as a result is compelling and gruesome. I originally picked this up at a whim because I thought that the cover looked interesting and the term "apprentice" always reminds me of my favorite time period to study (seriously... Who does not find the Middle Ages to be a fun topic to learn about?) It is a fast read that is completely original. It also does not hurt that it has some amazingly creepy illustrations (they look as if they were made using a printmaking method). This was such a great book that I recently bought 10 more from the series.